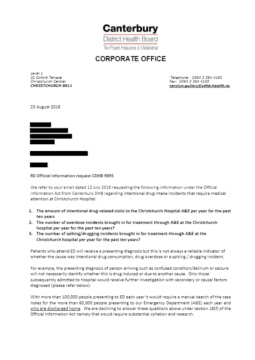 The amount of intentional drug-related visits to Christchurch Hospital A&E for the past ten years. The number of overdose incidents brought in for treatment through A&E at Christchurch Hospital. The number of spiking/drugging incidents brought in for treatment through A&E at Christchurch Hospital. The number of admissions to the hospital due to drug-related incidents. The number of ambulance call-outs to treat a person due to intentional drug ingestion.